Panerai / Sport / Leather / 40-44"
The Panerai Luminor Marina, Pam 111 was inspired by one of the first Luminor models of the 1940’s designed for precision and reliability. The Pam 111 features an 8-day Angelus Movement and easy to read dial with the distinctive small seconds dial at 9 o’clock, luminous hour markers and Arabic numerals at the quarters. 44 mm in size and water resistant to 300m, the Luminor Marina features an anti-reflection Sapphire crystal and is highlighted by its Stainless Steel Bezel and optional Black Rubber or Brown Leather Band. 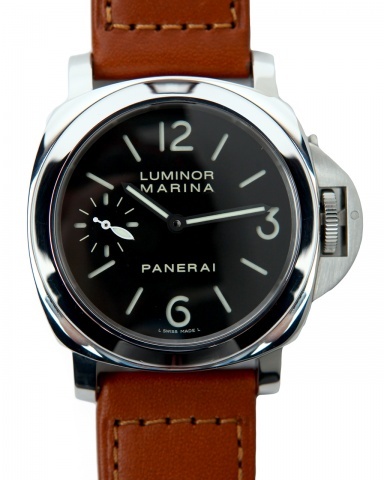 This exceptional timepiece is one of the most coveted watches made by Panerai and is a staple in any collection. We guarantee delivery by 8pm on your borrowing start date. Borrowed Time Watch Company is our solution to the complicated world of Luxury Watch Sales - a truly unique experience for those who demand more. Copyright 2013 BorrowedTime. All right reserved.